The Cybex Hydro rower pro commercial rowing machine has been designed to emulate real rowing—to feel smoother and more secure from top to bottom. The dual rail provides steady feeling movement. Foot straps are quickly and easily fastened or released. Powder-coated quartz white aluminum frame resists wear and tear. Variable fluid resistance provides instant catch and smooth strokes for any level of exercise. Console read-out includes time, distance, 500m split time, strokes per minute, calories per hour, watts, and heart rate (requires heart rate receiver kit, strap not included). The unique resistance system delivers a smooth and natural feel, providing constant resistance with each stroke. An adjustable footboard and foot straps make for a comfortable and safe rowing experience throughout your workout. 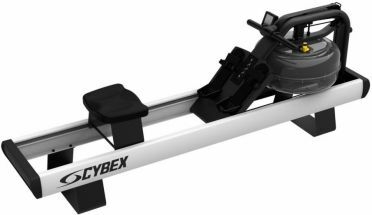 The Cybex Hydro rower commercial rowing machine features four resistance levels that can be adjusted on-the-fly to accommodate and challenge every rower. Removing the need to add or siphon water to change your workout level. 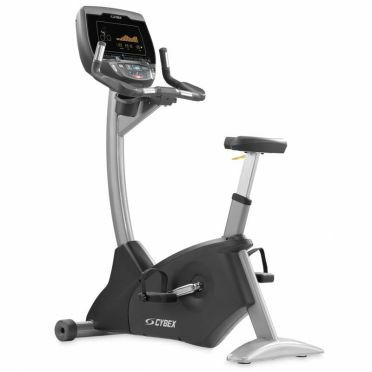 Console displays workout details including time, distance, strokes per minute, and 500-meter split time, as well as heart rate monitoring with optional receiver and chest strap. A walnut brown wood finish and steel frame provide the premium look you’ve come to expect from Cybex and will be a great addition to any home training environment. 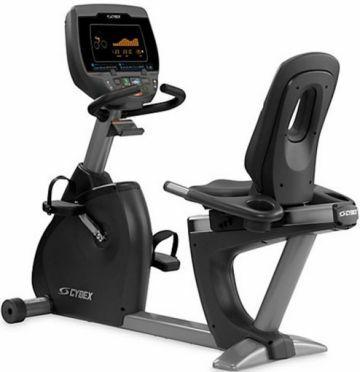 For those who demand uncompromising performance and results, only the Cybex 770R recumbent bike pro 4 LED console will satisfy the need. Introducing the Cybex optional E3 View embedded monitor with three distinct viewing modes that deliver the precise content that you want on a 15.6” high definition screen. Exercise is more fun with the latest technology from Cybex. Ride outside or train for the Tour de France. This is the most unique bike in the industry, with three modes of operation and 9 workouts with 21 levels. The Target-Speed bar helps drive the user to an effective training pace. 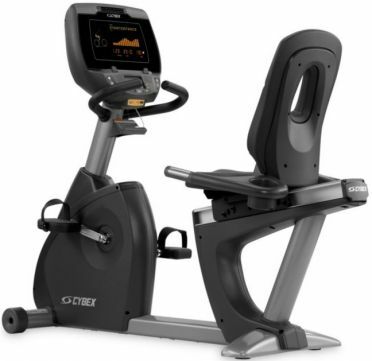 Cybex 625R recumbent bike LED console combine contemporary design with exceptional reliability and extraordinary usability. From their stunning good looks to hidden details like its self-tensioning drive, these bikes are destined to invite users of all capabilities and will keep performing for the long run. The console is designed around ease of use with clear centralized controls and the optional wireless receiver adds seamless entertainment. 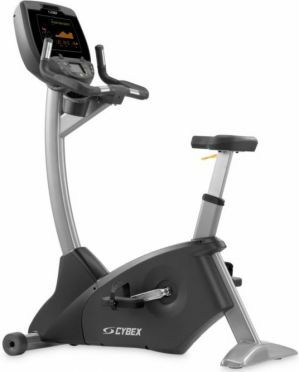 For those who have never ridden a bike before and those who are preparing for the Olympics, the Cybex 625R is the perfect piece of equipment to train on. The most deconditioned user or rehab patient can use it safely because of the low power input requirement (20 Watts) and it goes up to 900 Watts (to make a grown man cry). This is all possible because of the Cybex self-tensioning drive. 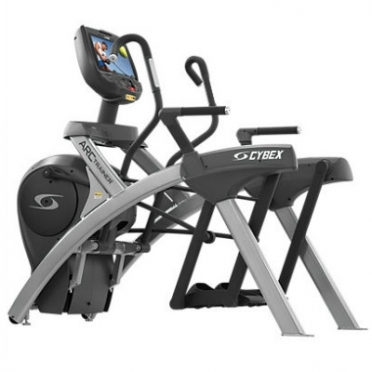 More results in less time with the Cybex Crosstrainer total body arc trainer 770A. 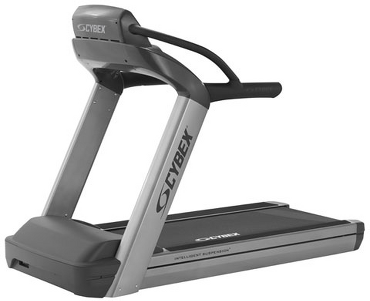 Research shows that the Cybex Arc Trainer burns more calories than any other cross trainer or elliptical cross trainer tested. The science behind the Arc Trainers big calorie burn is the Arc motion. It engages the right muscles quads and glutes that demand lots of energy from the body when they are called upon to work. That means big calorie burn. And because the Arc is demanding of the muscles, not the joints, it can be used longer without putting a strain on the knees, hip or back.